Father Olivier is a young priest with low-level magical powers who leaves his order to seek out an island called “G,” where it is said that any explorer’s wish may be granted by the exiled God who sleeps there. As he begins his journey, Olivier ends up performing a miracle for an innkeeper who welcomes him as a guest. It’s a small miracle, which Olivier considers payment for his room, but the innkeeper insists he accept a thank-you gift in return. The “gift” turns out to be a pretty, young slave woman named Ouri, who has had a spell cast on her to keep her from speaking. Initially refusing to take a human as a gift, Olivier is eventually persuaded by the slave herself, who does not want to be sold off to the highest bidder. The two make their way out of town, but they soon discover that they are being pursued by a Dark Elf named Suzu, who has been sent to retrieve Olivier and return him to his order. Unable to hold up against Suzu’s superior magical power, the best Olivier can do is release Ouri from her silencing spell, at which point it becomes clear that she is more than she seems, taking Suzu by surprise with her own magical skills and leading Olivier out of danger. As their journey continues, Olivier’s traveling party grows to include both Suzu, who discovers she has more loyalty to Olivier than she does to the order she serves, and a fortune teller named Shazan who follows them from one of their stops along the way. Gestalt is written in the style of a fantasy RPG, so much so that it actually includes notes about the race, age, occupation (including what level of spells may be cast), and magical level of each character as he/she is introduced, as well as detailed notes about each spell used in the story, including cost, spell level, area of effect, and any other characteristics unique to the spell. While this sounds like something that could easily be irritating (or at least distracting) in manga form, it actually suits this lighthearted tale well and may actually make the story’s obvious fantasy formula more palatable with its transparency. There is nothing new or particularly unique about the story, but the characters are likable and provide enough mystery to be compelling. Ouri is the most obviously intriguing of the bunch, as it becomes more and more clear that she is very far from what she seems. Over the course of the volume, figures from her past turn up one by one, mainly her own siblings who are apparently determined to kill her. The more quietly interesting character, however, is Olivier, whose reasons for suddenly abandoning the priesthood to seek out a God whose name his order considers too dangerous to be spoken are barely touched upon in this volume. It is hinted that he, too, is more than he seems, though it is likely he may not even understand this himself. Ouri’s devotion to him is largely unexplained as well. Considering what is known of her background, it seems unlikely that it is really about her having been given to him as a slave (and certainly Olivier would not condone that himself), but it’s clear she feels genuine affection for him and there is even a bit of sexual tension, made more interesting by revelations that shall remain undisclosed here. Most of the primary characters are sorcerers of one kind or another, so there is a lot of casting and summoning and calling upon higher powers to bring forth various beings. “With only level one summoning powers, you can’t call for a monster stronger than a salamander,” is pretty typical of the dialogue, but there is enough freshness and energy in the storytelling to please those of us who might otherwise find this type of fantasy tedious. Much of the non-RPG-like dialogue is actually really funny, particularly Ouri’s irreverent outbursts (“Hey lady, I’m outta meat here!”) and Father Olivier’s frequent requests for God to forgive him for such sins as “being too powerless to stop the slave trade.” Both the humor and atmosphere are reminiscent of Hajime Kanzaka’s Slayers, with Ouri cast as a coquettish Lina Inverse. The art is cheerful and fairly easy to follow, even during action sequences, and though a few of the character designs are a bit too similar for easy identification (the male characters in particular), they are fun and attractive, much like the story itself. Though its first volume offers nothing truly special, Gestalt‘s lively, classic RPG-style fantasy provides a nicely engaging read. 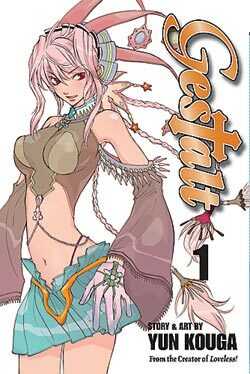 Volume one of Gestalt will be available in stores on June 16th, 2009. Review copy provided by Viz. Hee, well, dinner pretty much. It’s actually one of the bits that reminded me so much of Slayers. I’m always impressed at your professionalism, Melinda, as well as your ability to find something of value in just about everything you review. I really struggled with Gestalt, as it pushed a lot of my “ugh!” buttons. (As in: “Ugh! Fan service!” “Ugh! Arbitrary plot twists!”) Your review makes me think I ought to give it a second try. What a nice thing to say! Heh, I can completely understand how your buttons would have been pushed with this. I think I just decided early on, “Ohhhh it’s just like playing an RPG!” and though I actually dislike RPGs most of the time, I have played enough of them (my husband is an avid gamer) to feel a sort of vague fondness for it. It’s… something familiar thrown into a place in which I did not expect to encounter it. Or something like that.